Finally, lets talk about NBA’s lost legend, Bobby Jones was a power forward in the ABA and NBA. He is a basketball legend people say. 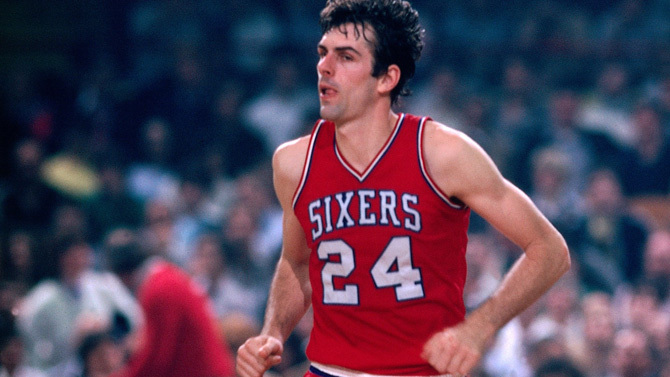 He is a Philadelphia 76er legend and has his number 24 retired in Philly. Jones was the 5th overall pick in the 1974 NBA Draft. He went to North Carolina for his collegiate career. He was good in college also. Jones played 12 seasons. 4 in the ABA and 8 in the NBA. Jones was a mean dude and played hard ever play. Who said white man can’t jump? Because Jones could jump and soar thru the air. He was gifted and played defense like no other could, also he was really good offensively. He was money. He made every big shot at the right time. If there was one man I would want to shoot the game winning shot it would be Bobby Jones. Jones was a good passer also. Jones career points per game 11.5 in the NBA and overall career of 12.1 between the NBA and ABA. He was a good rebounder also and averaged like 7 to 8 a game. This was the time where the NBA shined and was worth watching. You could play physical and see teams play defense, which nowadays defense is rare to see, unless you are the Memphis Grizzlies. Jones was the best and first to ever win the 6th man award. That is why he deserves to have that award in his name. The Bobby Jones Award sounds much better than the 6th Man Award. Players respected Jones. Herb Williams a former player said ” Jones is one of the best defenders to ever play the game” and John Salley a 4 time NBA Champion said “Jones was the best 6th man ever”. Jones famous signature pose was scoring or assisting a pass and pointing his index finger at his teammate running bad to the defensive side. Jones played along side one of the greatest players ever. That man was Julius Erving. These 2 were a huge tag team. Hell, Mo Cheeks and those 2 made the Philly 3. Jones will go down as the greatest player who never got recognized for his play. Also, people say Larry Bird was the greatest white player to play, well I personally think Bobby Jones was. Jones was a 4 time NBA All-Star and 8 time NBA All-Defensive First Team. He also won a NBA Championship with the 76ers in 1983. So, NBA you should reconsider changing the 6th man award to the Bobby Jones Award! Bobby Jones a unknown legend, but known in Philly. Previous Post Magic Get Napier !